You have probably heard of the Tuskegee Airmen—a group of African American pilots who fought in World War II. But what about the Montford Point Marines? The contributions to the war effort by these African American men who served with the U.S. Marine Corps have been overlooked by historians and others. Finally, they are getting at least some of the recognition they deserve. During World War II, the Marine Corps resisted desegregation, even when ordered to allow black men to enlist. The Corps commandant reportedly said he would rather have 5,000 white enlistees than 250,000 African Americans. Thus, a separate camp, called Montford Point, was established to keep the black enlistees away from the white marines. The black Marines were treated badly: their barracks were flimsy and beatings were common. In the face of such bigotry, the Montford Point Marines served honorably in the Pacific theater of the war. They took part in the capture of Okinawa from the Japanese and made a valiant stand at Iwo Jima. After the atomic bomb was dropped over Nagasaki, Japan, the black Marines were sent in to clean up the ash. When they returned from the war, though, most of the black Marines were discharged, even those who wanted to stay in the Corps. They also faced discrimination daily, along with other African Americans. On October 25, the U.S. Congress voted to grant the Montford Point Marines the Congressional Gold Medal, which is the country’s highest civilian honor. “It’s long overdue,” said Commandant General James Amos. Most of the 19,000 Montford Point Marines have died, but those still alive no doubt agree wholeheartedly. Read about efforts to recognize the Montford Point Marines. 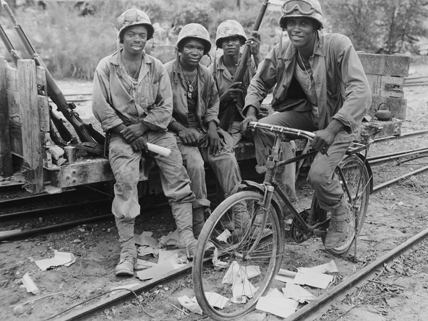 Watch videos, view photos, and read more about these African American soldiers. Read the text of the historic announcement awarding the Congressional Gold Medal to the Montford Point Marines; includes additional videos. This Web page provides an overview of African Americans in the U.S. armed forces. I guess This Is A nicee Boookk .